New Website – Coming Soon!!! Please return to our site around mid-August, 2018 to see our entirely re-vamped website. It’s coming soon! The new site has a colourful, completely new look and our members galleries are re-vamped with lots of art, pottery, jewellery, books, music. We have moved to a new hosting service with NO ADS! The site will have On-line sign-up for art shows, membership and the free Artsy Happenings newsletter. In the meantime, our Facebook page and revamped Artsy Happenings e-newsletter is where the latest information is available. To subscribe to the e-newsletter, email: artsynews@artscarletonplace.com. and improved the look of our newsletter. We’re all dressed up and giving you great places to go! Remember to click on icons for more information – clicking on our logo you will get you to our Facebook page, clicking on Farmers’ Market will get you to their Facebook page, clicking on the Paint the Summer… you get the picture or icon, lol! It’s gonna be such a great summer! I’m so excited to tell you about what’s happening in the next few months. CP Library and Downtown Carleton Place are running an ongoing event every Friday evening during the summer called Art in the Park(ing Lot). It’s a library block party @the Art Shack. the art supplies and challenges. Two little artists went to the market, and invited all their friends to not stay at home. showcasing art from a sample of our wonderful members. Last month, Arts Carleton Place members Anne Forsythe and Carolyne Buchanan recruited new members/patrons of all ages. It’s never too early or too late to be creative. you may find that special work of art you were looking for! “Paint the Summer” at Algonquin College’s Perth Campus. Free admission, free parking and free shuttle service. This event is a fundraiser for Lanark County Interval House. It’s a show not to be missed! sale of art books and prints, and refreshments. at Art Journey, a juried summer art show in Smiths Falls. Come see her new work for 2018! Please support this important initiative to make a difference in the lives of communities who sometimes struggle to have quality teaching tools in their schools and community programs. Remember to keep your eyes open for the outdoor pianos on Bridge Street. 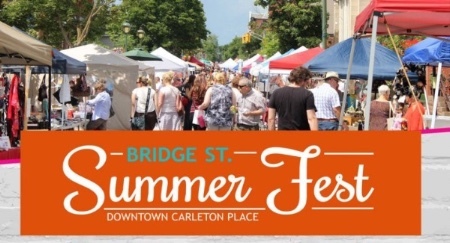 So many reasons to come to Carleton Place and enjoy the Summer! That’s all I got for now folks. Get out there and get creatin’! Be an art hero, promote local artist and share this email. Funny picture for an artsy newsletter you may be saying to yourself – especially odd for those who know me as I don’t fish… or do I? is one of those Canadian jazz musicians – like the great Oscar Peterson – who infuse passion and persuasion into every moment of every performance. He has won two JUNO awards and had had several JUNO nominations. Alan Jones on drums. JazzNhouse is privileged indeed to have the Jon Ballantyne Quartet end our successful, JUNO-laden performance season! Tickets $35 online only, at http://jazzn.ca/program.html#20180616. A cash bar will be available. an entertaining evening. Cover charge is $10. Doors open at 7pm. The Art Shack is at Lambs Down! One side of the Shack will be decorated as an activity for the kids! Come Celebrate 100 years of the Canadian Co-operative Wools Growers. Enjoy goat yoga, pancake breakfast, maker market, Stalwart beer garden, food vendors, amazing music, sheep shearing and sheepdog demonstrations. A vibrant display by 25+ local artists including members of NGAG along with students of ST. Michael’s Catholic H.S. and North Grenville District H.S. Summer’s here and the time is right for a piano on Main Street.. They’ll be singing, swaying, piano playing and dancin’ in the streets… The whispers are true, this summer the BIA will be launching TWO outdoor pianos located in and around the BIA. If you wish to learn more, want to sponsor or be involved, contact the C.P. BIA office. 1st Canada Activities at Riverside Park, Bridge St. Summer Fest etc. Since its inception, ACP has depended on volunteers to promote the arts in our community and beyond. ACP is a growing organisation where you will earn invaluable experience, learn, and also contribute to building and impacting the community. Through ACS you can expand your leadership skills by taking initiative in advancing new art projects. You will meet new people and have a whole lot of fun. If you wish to stop receiving this newsletter, please contact me. I just had to mention it in the intro. So excited! Also, please check out a rescheduled event that takes place tomorrow – it’s at the top of the list. Victor Maltby will be playing with Long Sault Trio at their first ever CD release party! $10 or donation at the door. Bring your instruments for an acoustic jam if you are so inclined! Victor Maltby will be playing with Long Sault Trio at the lovely Fiddleheads Bar and Grill. Come out for a fun-filled evening of good Lanark music, beer and food! 5pm – 9 pm on May 4.
and include watercolour, oil, acrylic, mixed media, coloured pencil, graphite and more. Are looking for a special gift for an event this summer, or maybe some special piece to help you welcome in spring? You’re likely to find it here! of the region: Almonte, Kanata, McDonald’s Corners, Perth, Portland and of course Carleton Place. The show will feature original works in oils, watercolour, acrylics, fused glass, photography, wood and jewellery. Admission is free and there’s plenty of free parking. Visit us on Facebook: https://www.facebook.com/artscp/ to learn more. 50+ different hand makers each day! The place is flipped overnight. Admission $2, Kids + parking free. A classic 1950’s Broadway Musical depicting 1930’s New York. There are seedy characters, there are righteous characters, and there are bets being made on and off the tables. Come enjoy the songs, the dancing and the love story…yes there’s a love story! one of the most exciting and vibrant forms of jazz, known as gypsy-jazz. on the duo, please visit our website. Meet award winning children’s author Natasha Peterson and have your book(s) signed. is one of those Canadian jazz musicians – like the great Oscar Peterson – who infuse passion and persuasion into every moment of every performance. Open Doors for Lanark Children and Youth present their 1st annual art show and sale. This exhibition/fundraiser features a wide range of original, unique and affordable works of art. The funds raised from this sale will help fund the ODLCY youth bursary program. More information coming next newsletter. The Art Shack is scheduled to open on June 16th, 2018. Artists if you are interested in sharing your time and your art, be it music, storytelling, painting etc., please contact Moriah Caswell at 613-257-2702 or Kate Murray at 613-257-8049. Tell me, tell me, who can we turn to? We need people we can hold on to. Let us try you, come on baby give us a call! Wasn’t that a great song by Tommy Tutone? Do it for him, do it for Tommy! Send us an email and let me know you wanna be part of our band! This article will blow your mind if you haven’t yet heard about the Vogels. Honestly, I want to be them. Check it out! To quote the words of Carol Burnett, I’m so glad we’ve had this time together. Hope to see you at the show! Remember to pass this newsletter on to a friend who may be interested. It’s here! It’s here! Are you ready? The Annual Spring Show and Sale! Oh, and spring is here too! (They go hand in hand.) This morning outside my window, a few cheery crocuses bid me good day. I truly believe that there “ain’t no Spring Fever” like a “Canadian Spring Fever”. and all this while in shorts in 5℃ weather! LOVE spring! And LOVE art shows! I know, it’s the wrong season. But really, I’m just as excited! As you may have noticed, I’ll be there too! So please, please, please come by and visit. in the room… Just come on by! Besides OUR art show, there is a plethora (such a great word!) of things to do in April-May! for the needs of remote Indigenous communities in Canada at the private screening for Indian Horse at the Canadian Museum of History. Natasha Peterson (Author), Anita Schlarb (Photography), and Liz Allison (Stoneware). and Glenn Robb (drums). No cover charge. Entry to the show is free. Friday night vernissage is $10.00. Tickets are available at Office Pro and at Lindsay & McCaffrey in Manotick, or online at www.manotickart.ca. standards and jazz classics. No cover. Award winning children’s book author Natasha Peterson will be at Ottawa’s largest and most popular parenting and kids expo. Tickets range from $6 to $30. Featured artists are: Thérèse Boisclair, Nora Brown, Barbara Jordan, Aileen Merriam, Peggy Orders, Pat Purdy, Cathy Rivoire, Linda Svarckopf, Judith Versavel. Maple inspired refreshments will be served. A sweet celebration in scenic downtown Perth. Come out Saturday and Sunday to have a peek at the amazing artwork our Ottawa Valley has to offer. Find that piece you were looking for!Admission and parking are Free. The warmth and intimacy of the music will be captured perfectly within this Pakenham venue. Reserve soon to avoid disappointment! For more information on the duo, please visit our website. Have you heard of this new exciting project? 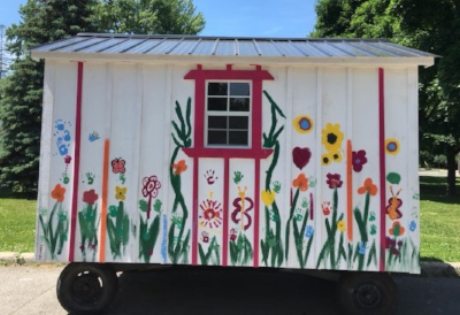 This summer, starting June 16th, there will be an Art Shack in Carleton Place. A place where you can do art outside… for free… with your friends… for free… Amazing! I’ve been signing Art Shack to the tune of Love Shack by the B52s ever since I heard about this. Stay tuned for more information in the next newsletter. Hello? Hello? Are you there? Oh, there you are! I knew you were there! Want to get involved? We need some help. Yes, I know, we’re always asking for help. We probably always will. Please contact Suzanne Deschênes at: smdeschenes1951@gmail.com to volunteer. Check out some of the featured artists at the upcoming show. Help us promote our organisation/show. Like, like, like, share, share, share and remember to leave a comment! This is one of our most important events of the year! Let’s get it out there! Like, like, like and share, share, share and remember to leave a comment! Like, like, like, share, share, share! So, well, that’s about it for this month. Keep your head up and eyes posted for our signs. They should start to magically appear around April 30th. Remember to point them out to your friends, while keeping your eyes on the road! March and all it’s wonders is finally here! I wonder if it will be sunny, I wonder if it will be warm, I wonder why I didn’t book myself a trip down south??? the Mississippi Mudds Junior. This show is sure to delight audiences of all ages! Jan Gilbert’s acrylic paintings on display. the world as they see it. This exhibit is running at the Dean Hall in MERA during the month of March. in colourful surroundings injected with elements of fantasy and bright patterns. and other environments while reflecting her emotional connection to the piece executed. Molly Forsythe carves her Highlands’ musicians and birds into clay, creating ceramic relief wall pieces. Entry fee is $5.00 and performers are free. The 16th Maple Run Tour is a “sweet” reason to Wander up to Pakenham. Experience inspiring art, craft, food and heritage locations. Indulge your taste buds in locally produced fudge, solar roasted coffee and craft beer. their only Ottawa area performance! Tickets are $25 and are only available online at http://jazzn.ca/program.html#20180407. As always, please reserve as soon as possible to avoid disappointment. Need some more great ideas for March? Don’t forget to celebrate St. Patrick’s Day with a pint of green beer or, of course, my favourite beer any day of the year, Guinness! Did you know that there is a “proper way” to pour this yummy draught? Check it out at www.guinness.com. Last, but not least, World Poetry Day is celebrated on March 21. Why not write a poem? Here’s one that I remember from high school. I think it was written in my yearbook. We need you and your friends too! So write that email, be real keen, become a member of our team. Well, that’s all I have for now. I look forward to receiving any contributions, questions or comments regarding our newsletters. And, if you have a minute and want to help us out, let me know why. Have a Mad March (in a good way) Everyone! The Annual Arts Carleton Place Spring Fine Art Show & Sale is on Saturday, May 5 and Sunday, May 6, 2018, 10am – 4:30pm at the Carleton Place Canoe Club, 179 John Street, Carleton Place. There are 35 spaces available to be assigned on a first come, first served basis. Entry fee is $65 to $125 – 2 types of grid sizes available with 4 feet deep kiosks available for larger pieces. Authors tables are also available. Registration deadline is March 15 and is considered complete when payment is received in full. A $20 Arts Carleton Place membership is required to participate. Art sales payments will be taken at a central cash, with a small commission to Arts Carleton Place (5% on cash sales and 7.7% on credit sales) in support of the local bursary program. Sales reconciliation and electronic money transfers to artists will be completed 10 days after the show ends. Signage will go up 3 weeks in advance of the show; 375 visitors per day are targeted. If you have any questions please contact Suzanne at smdeschenes1951@gmail.com. Lunch for artists will be available on a cost-recovery basis from Beckwith Kitchen (with some limitations). Further details and forms available at www.artscarletonplace.com. Welcome to February! It’s the shortest month of the year, with so many great things to do! Not to worry, we’re here to help make your February blahs into February Yahs! …just made that up! in painting (acrylics or water-based oils) or in drawing techniques. Coloured pencil lessons are also available. own projects in your choice of medium under the guidance of a professional artist. Peter’s trio plays standards and jazz classics in this fine Italian bistro. Another wonderful theatre production by our local Youth Theatre! Tickets $10. All Shows, except for Thursday, March 1 – discounted pricing at $5 each. (across from the Town Hall). Artists look for it in your inbox and spread the word! or Kurt Cobain (Feb. 20), or one of my favourites, Johnny Cash (Feb. 26). Renoir (Feb. 25) and Victor Hugo (Feb. 26). Check them out on the Internet or at the library! Get out your best china and have tea while reading some Dickens. You get the picture! We know you’re out there and we have jobs for you! Join our team and meet some super fun, creative people! Great article to read – What do people want to see in the future? Well, that’s all I have for now. I look forward to receiving any contributions, questions or comments regarding our newsletters, please do not hesitate to contact me at: carolyne.buchanan.art@gmail.com. Welcome to part 1 of the first newsletter of 2018! It’s a long one with tons of important information so be sure to read to the end. First, please let me introduce myself: I’m Carolyne Buchanan and I’m Artsy Happenings e-newsletter’s new editor. 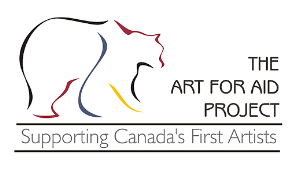 I am thrilled to be a member of Arts Carleton Place and to help you promote your amazing art! First the great news! Arts Carleton Place had a successful 2017. We gave back to the community as a whole, and are in great financial shape. Now, the good news. Sometimes what appears to be a setback is just an opportunity to adjust and adapt and set the stage for new growth and development. Low attendance at the Annual General Meeting (due to the snow) meant that the key positions of Secretary, Vice-President and Media Relations Coordinator remain vacant. Here’s the adjust and adapt part: Going forward, a small committee of people will share the responsibilities of the vacant Board positions and work together to produce our annual shows and assure a strong presence in our community. Recruiting people with different skill sets and abilities to sit on our board will remain a top priority. Dedicated ACP members will continue to work hard to find dedicated individuals to fill these positions by next year. We are planning a special members-only BBQ meeting on June 10th to encourage more members to come forward. I know, in the mid-January cold, June sounds far away but doesn’t a BBQ sound good? Don’t forget to mark your calendar! Now, the call to members who have shows, vernissages, classes to offer, performances or any other noteworthy event(s) in February, March or April that they would like to share with our members and patrons. – on our Facebook page. Please note that items scheduled for later dates (March 8th to April 30th) will be noted under our new section: “Mark Your Calendar.” This column was created to give our wonderful patrons ample lead-time to support your event. These same entries will appear in full in the corresponding e-newsletter months. See the attached “Notice of event example” for more information. Doing a show in Toronto or Vancouver? Let us know! We have many members and patrons with family and friends in other cities so send us the information you would like included in our newsletter. To submit your event, please fill in the attached form “Notice of event” and submit it to me by January 26th, 2018. The e-newsletter will go out on January 29th in order to promote events taking place earlier in the month. Remember, there is a “Notice of event example” attached for your information. Yes, it’s that time of the year again, Membership renewals are now due. The Board of the Arts Carleton Place Association modified it’s membership year (in 2016) to have all memberships expire on December 31st of each year. To renew your membership, you can download the attached revised form or complete one at Surrounding Memories at, 77 Bridge Street, Carleton Place. Should you have any questions regarding membership, please contact Suzanne at: smdeschenes1951@gmail.com. Is volunteering one of your New Year’s resolutions? Get a head start on keeping this one and volunteer today to help out at the Spring 2018 Fine Art Show. Volunteers are needed to take care of lawn signage and the posting of flyers and postcards. No special skills necessary, you just need to commit an hour, or two, or three or whatever you can. We’ll take it! Contact Suzanne Deschênes at: smdeschenes1951@gmail.com to become a volunteer super-hero today! Well, that’s all I have for now. I look forward to receiving and posting information about your upcoming events. If you have any contributions, questions or comments regarding the newsletter, please do not hesitate to contact me.